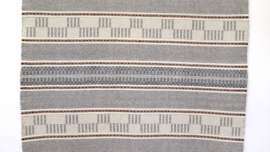 Last spring I had an enforced weaving holiday, brought about by the fact that my studio was turned (temporarily) into a storage space while we emptied our loft in readiness to have it converted and extended. 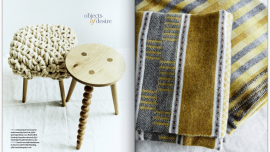 It was very hard to interrupt the creative process but it gave me an opportunity to do some of the other things I love and which I simply do not find enough time for – hand spinning and naturally dyeing. 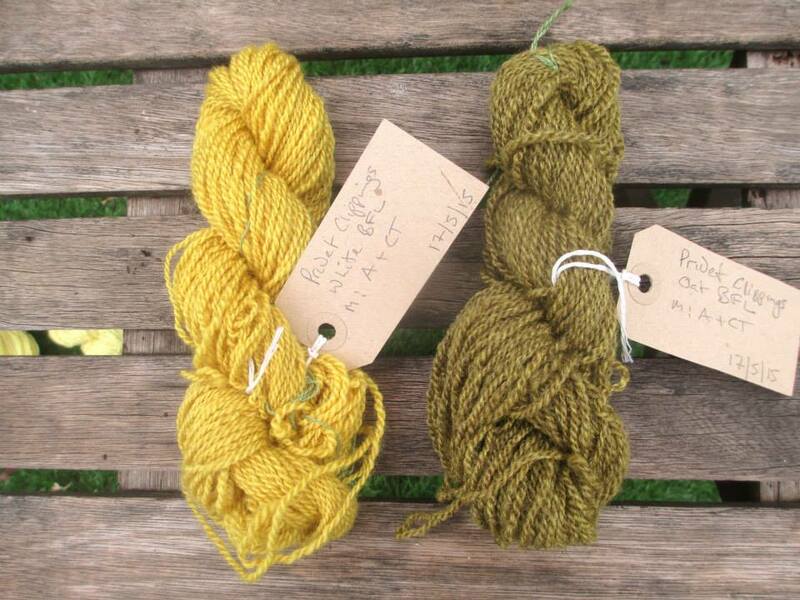 So this series of blogs takes a look at some of the lovely yellow and green shades I achieved with dye stuffs from my garden and allotment and one or two from gleanings from our May trip to Cornwall. All the skeins are my own handspun 2-ply Bluefaced Leicester (BFL), or light oatmeal BFL. They were all mordanted with alum and cream of tartar. I use a standard formula of 8% alum and 7% cream of tartar. 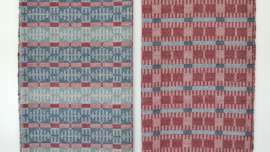 One or two of the darker green shades had the tiniest pinch of iron added at the end of the dyeing process to sadden or darken the colour. Looking at the photograph again and starting from the left side at 9 o’clock, with the one that is a pale champagne colour, and working around clockwise, these are the dye plants I used. 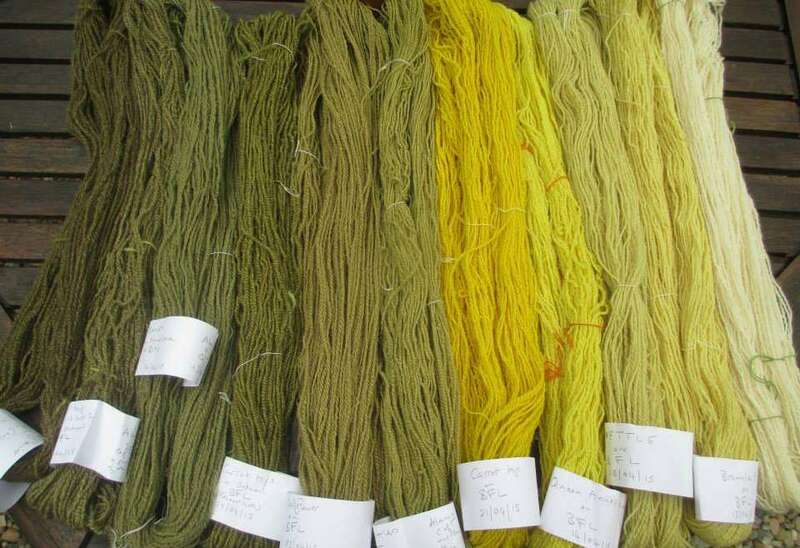 Of the green shades, some are dyed on the white BFL, some on the light oatmeal BFL. Continuing on from 3 o’clock: Wallflower flowering tips (LOBFL), Carrot top (LOBFL), Bramble tips (LOBFL), Hornbeam prunings (LOBFL), Willow clipping overdyed with Privet (LOBFL), Privet clippings (LOBFL), Carrot tops – 2 skeins (LOBFL), Willow shoots and leaves (LOBFL), Wallflowers (BFL), Nettle tops (BFL), Comfrey leaves (BFL). The last two skeins in the middle are: Nettle, bramble and Queen Anne’s Lace exhaust baths + pinch of iron (the green shaded skein), Comfrey flowering tops (the acid lime coloured skein). Both are on natural white BFL. 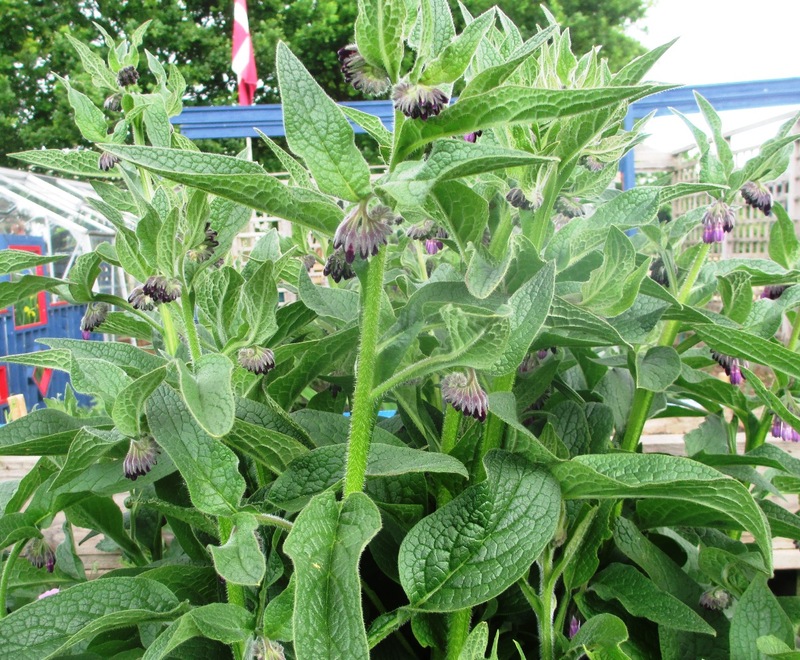 First photo is of my comfrey plants growing in one of the borders up at the allotment, then comfrey flowering tops in the dyepot. 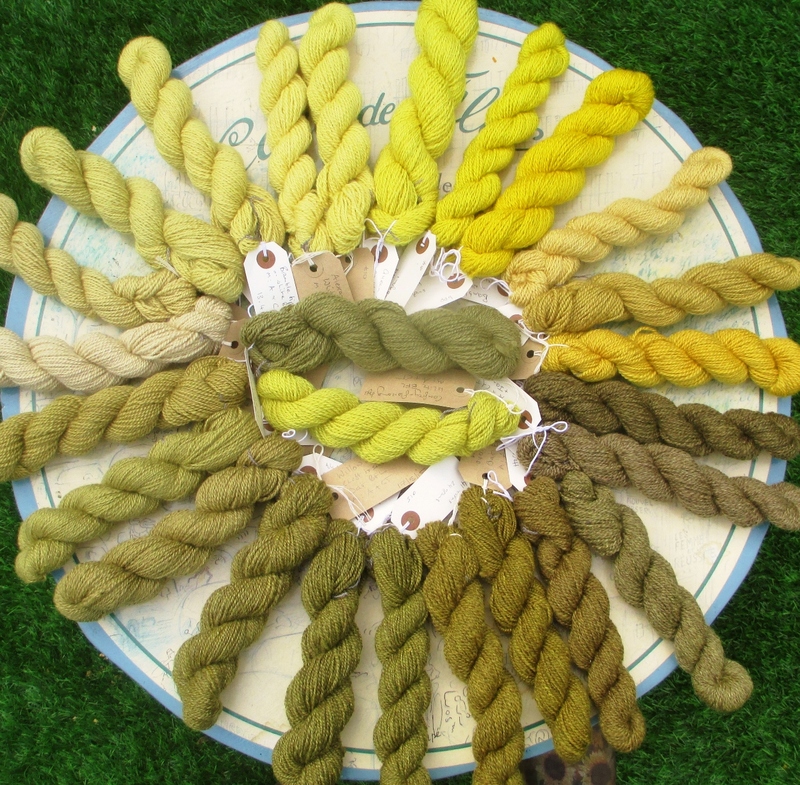 In the last photo you can see the results – left hand skein is white BFL dyed with comfrey leaves which gave a lovely soft olive green. 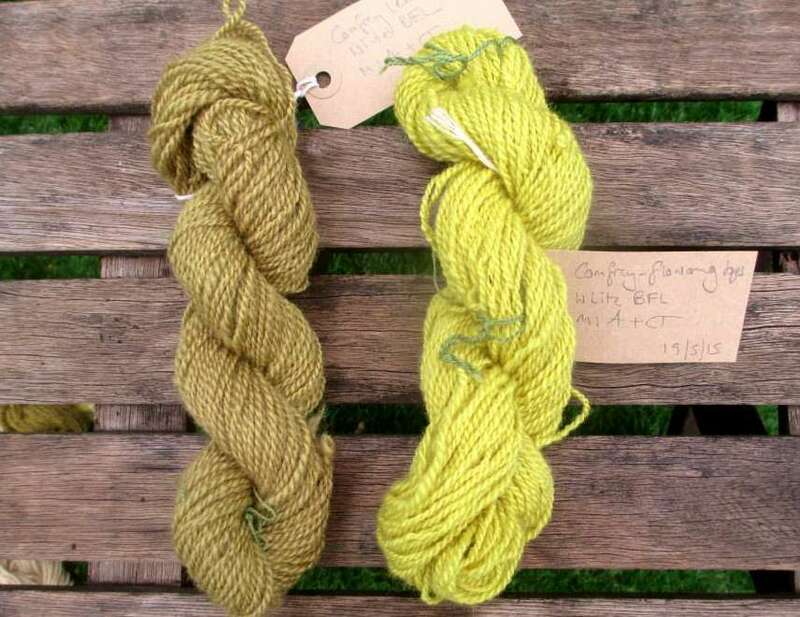 The right hand skein is white BFL but this time it was dyed with the flowering comfrey tops, giving a truly zesty lime-yellow colour. Two great colours from the one plant. 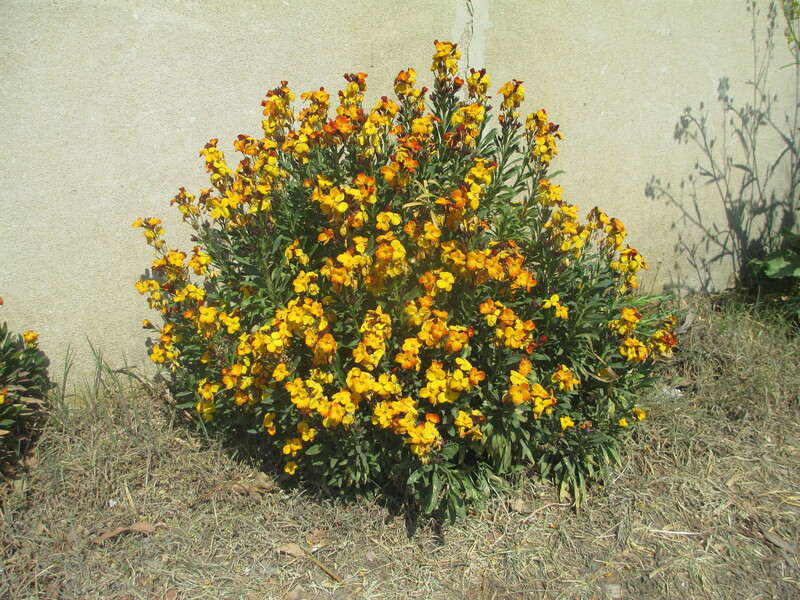 Wallflowers, also at the allotment. 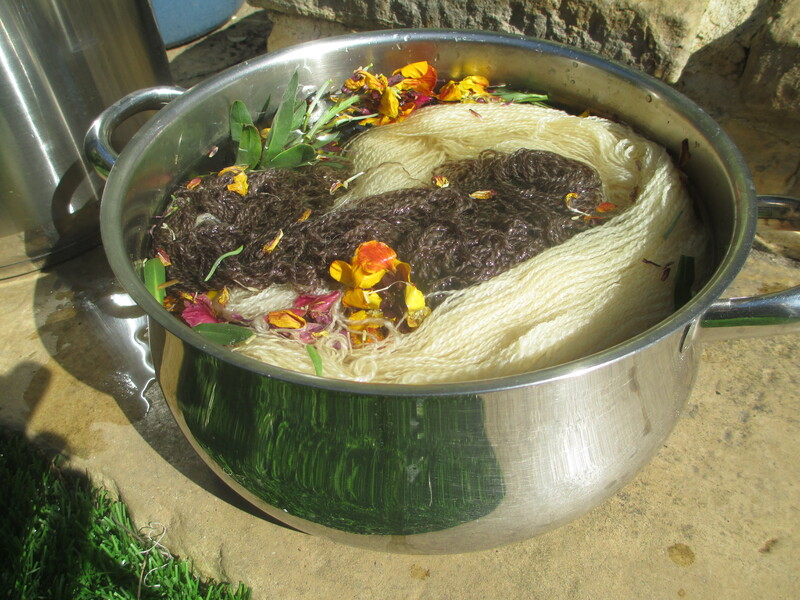 And wallflowers with yarn in the dyepot, this batch being heated and extracted with the yarn. 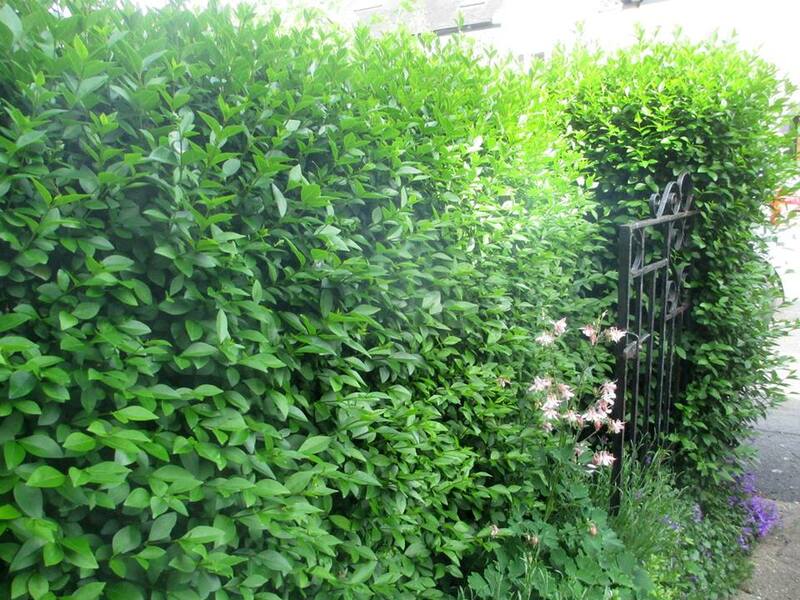 Here you can see the privet hedge that I used for the next skeins, as it was before clipping. 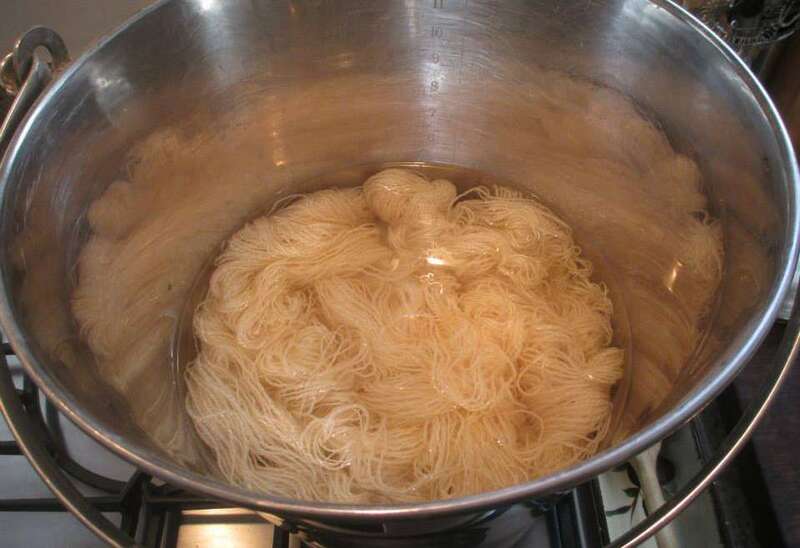 The skeins are white BFL which came out a really strong gold colour and oatmeal BFL which gave a dark khaki green. Privet is a really useful dye stuff if you want a strong yellow and just think how much of the stuff is just there for the taking in our town gardens! Skeins of my handspun yarn dyed and labelled. Last of all, one photo of my handspun yarns straight from the dyepot with their working labels on giving brief notes on yarn, mordant, and dyestuff. From left to right: wallflower on light oatmeal BFL, carrot top exhaust bath on light oatmeal BFL (+ pinch of iron), bramble and Queen Anne’s Lace exhaust baths on light oatment BFL (+ pinch of iron), carrot tops exhaust bath on light oatmeal BFL, wallflower on white BFL, nettle on light oatmeal BFL (+ pinch of copper), carrot tops on BFL (this is the flourescent yellow yarn), Queen Anne’s Lace on BFL, nettle on BFL, bramble tips on BFL, unmordanted skein of natural white BFL. 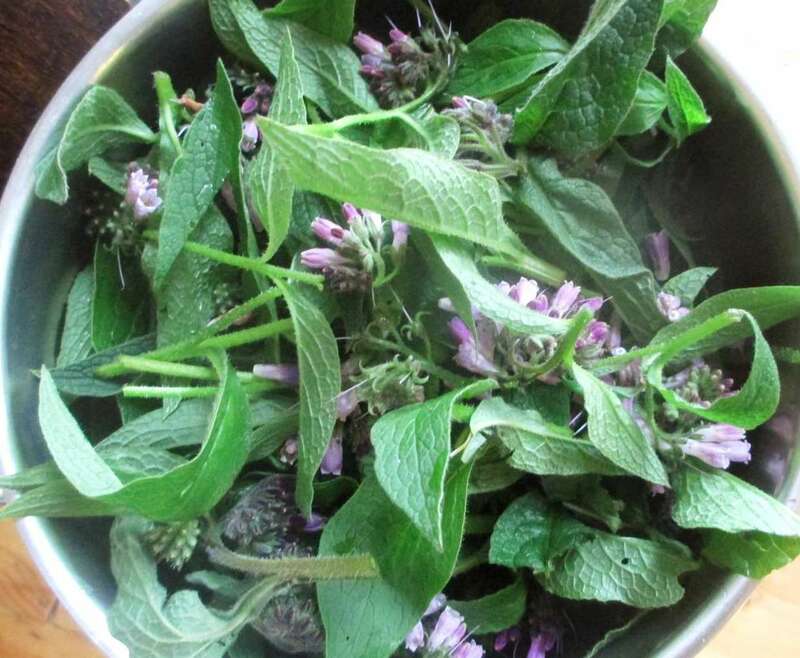 Next post will show some of the dyestuffs and colours I got from my Cornish gleanings.